Ottawa 2017 and Ottawa Mayor Jim Watson, in collaboration with lead partner CIBC, announced today that Red Bull Crashed Ice will make its Ottawa debut when the Ice Cross Downhill World Championship crashes and glides its way into the capital in 2017. Red Bull Crashed Ice events take place at unusual locations with stunning backdrops. The final showdown event in March 2017 will take place next to the Château Laurier and Major’s Hill Park at Parks Canada’s historic and picturesque Ottawa Locks, which form part of the Rideau Canal National Historic Site and UNESCO World Heritage Site. Parks Canada is working in collaboration with Ottawa 2017 and Red Bull to ensure all measures are taken to preserve and protect the historical features of this heritage treasure. The March dates for the Ice Cross Downhill World Championship will be announced later this fall when Red Bull releases the 2016-17 race schedules. This extreme winter sport is a unique blend of power skating, ski cross and boarder cross. The Ottawa event will welcome some of the world’s best athletes for the culmination of the winter tour season. Ice cross downhill is the fastest sport on skates where athletes hurtle down a massive ice track filled with high vertical drops and hairpin turns at speeds of more than 50km/h. A former racer himself, Red Bull Crashed Ice Sports Director Christian Papillon knows very well the heart-pumping exhilaration of the competition. “Ice cross downhill is fast, physical and intense. 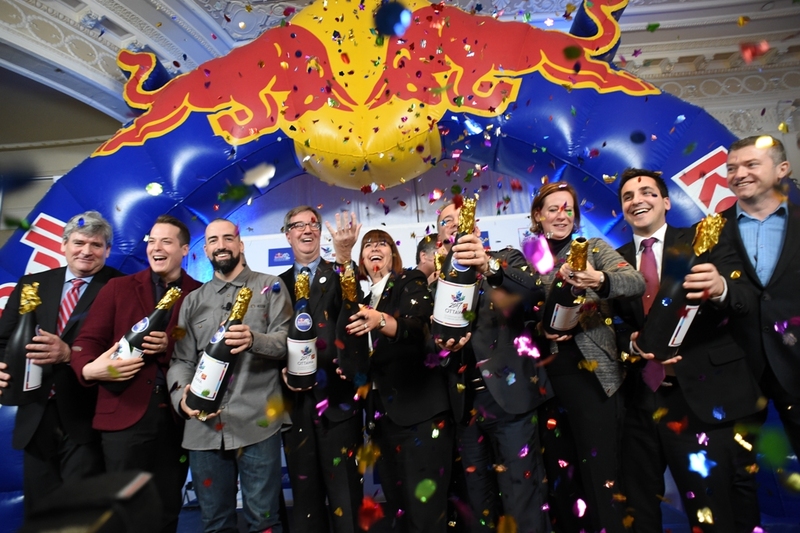 Red Bull is proud to contribute to the development of the sport worldwide and we can’t wait to showcase the action to people in Ottawa,” he said. Canada’s 150th celebrations will offer Canadians and visitors from around the world an exceptional and memorable year of high-caliber experiences while bringing a record number of visitors to Ottawa in 2017 to celebrate this important milestone for our country. Speaking on behalf of the Province, Marie-France Lalonde (MPP, Ottawa-Orléans) cited sport tourism events like Red Bull Crashed Ice as important to growing Ontario’s economy. “The Government of Ontario is committed to supporting events that attract visitors to the province from across the nation around and the world, boost local economies and create jobs,” she said. For almost a decade, Red Bull Crashed Ice has been a pinnacle event in Quebec City. It is the largest outdoor event in that city each year and attracts a global TV audience. Other cities that have previously hosted the event include Lausanne, Helsinki, Prague, Moscow, Edmonton and Niagara Falls. Ottawa 2017 is thrilled to present Red Bull Crashed Ice as one of its Signature Events and thanks our lead partner CIBC, the Province of Ontario, Ottawa Tourism and the Ottawa-Gatineau Hotel Association for their contributions. To make this exciting event happen in such a spectacular location, Ottawa 2017 is collaborating with the City of Ottawa, Parks Canada, Public Services and Procurement Canada, the National Capital Commission, the Fairmont Château Laurier and Stantec for engineering services.